"More specifically, the risk of suicide among divorced men was over twice as likely as that of married men, whereas in women, there was no statistical difference in married and divorced women." Suicide rates are at an all-time high. The age-adjusted suicide rate in the United States rose 24 percent from 10.5 to 13.0 per 100,000 population from 1999 through 2014, according to the Center for Disease Control and Prevention. For men facing a divorce or who have gone through the process, ending one’s life might be seen as a way to remove one’s self from the emotional and financial turmoil of divorce. The University of California, Riverside conducted a study examining marital status and suicide within the previously completed National Longitudinal Mortality Study and found that divorced men and women are at a higher risk of suicide than married men and women. Divorced and separated persons were over twice as likely, in comparison to married persons. More specifically, the risk of suicide among divorced men was over twice as likely as that of married men, whereas in women, there was no statistical difference in married and divorced women. There are several possible reasons as to why divorced male suicide rates are so high. Sociology professors at the University of California and their research suggest that much of it stems from the separation between father and child. In cases involving custody dispute, the courts are often ready to grant custody to the mother, due to an assumption that the bond between mother and child is stronger than that of a father and child. In the minds of those fathers, they have not only lost their marriage, but also their children and any assets or property that was divided during the proceedings. Between the feelings directed toward the ex-spouse and the ones directed at the courts that granted her custody, bitterness, anxiety, depression, reduced self-esteem, and a general sense that life “is not worth living” can manifest, creating a dangerous and fatal situation. Another contributing factor that is theorized is social integration. Men who have experienced a divorce are more likely to isolate themselves, creating an environment prone to low self-worth and poor mental health. Those symptoms do not only affect one’s social life. Work performance suffers. Familial interactions suffer. The spiraling effect creates a toxic atmosphere that allows for suicide to be considered an option, in order to end this suffering pattern. Please do not consider suicide an option. There are ways to improve one’s mental health and well-being without taking one’s life. Researchers and scholars at American Psychologist, a journal of the American Psychological Association, have widely found that men take advantage of health care, in terms of seeking help for mental health issues, addictions, counselling and other medical problems. This was found through studies regarding men’s discourses of help-seeking in the context of depression. A study found in the Sociology of Health and Illness journal shows that men often interpret depression as stress and the discourse of help-seeking was gendered, due to the masculine ideal that a man intolerant to pain does not seek the health care they need. Because of all of the mental, emotional and financial anguish that a divorce provides, men are often vulnerable to the toxicity that lends itself to suicidal thoughts or behaviors. Convincing men, especially those who have gone through a divorce, to seek help is not an easy task, but the American Psychological Association has researched beneficial ways of doing so, in order to help. Given the previously stated data, convincing a divorced man that the help that they need is “normal” will create a proactive discussion that will allow them to take the next step in their road to recovery. Another helpful method is making the terminology to describe helpful exercises like going to counseling or therapy more palatable to men. Even if it means using alternate language, researchers believe this to be preferable than having men not seek help at all. 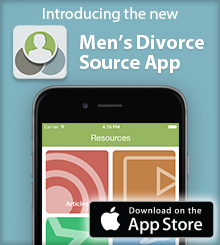 Although we, at MensDivorce, would strongly recommend seeking help through health care channels dedicated to battling suicide and preserving one’s mental health, there are resources dedicated to helping battle mental illness, depression and suicidal thoughts that don’t require seeking health care services. The National Suicide Prevention Lifeline provides 24/7, free and confidential support for people in distress and in crisis, through empowering individuals, advancing quality professional practices and building awareness. Man Therapy is a tool designed to help men with mental health and the realities of suicide. For veterans facing emotional distress or even the crisis of suicide, the Veterans Crisis Line is available to offer confidential, around-the-clock support through online chat, text or phone. These resources offer divorced men a chance to rebuild their mental health and take the next step forward in creating a new life for themselves. Utilizing these resources will not fix the problems they face overnight, but they will help them understand what these issues are and how to combat them one day at a time.